This product delivers a rock solid laboratory score of 119 mg of Beta-sitosterol and an overall sterol score of 257 mg. This company has a number of products and goes out of their way to make sure no one resells their products on Amazon. If you see UltaMan sold on Amazon you can be assured it is coming directly from the company not some re-seller or counterfeiter. The formula has a number of other prostate beneficial ingredients in it including: Zinc, Selenium, Copper, Vitamins E and B6. 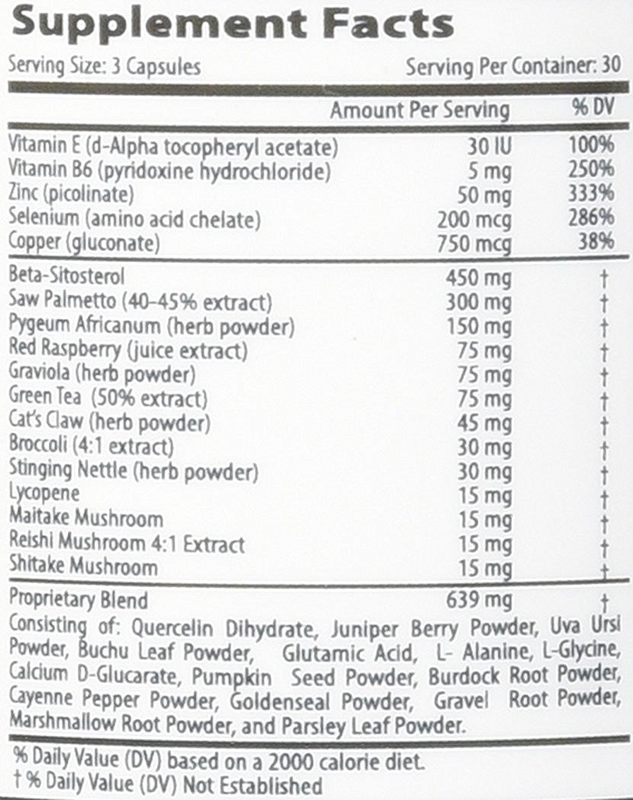 It also has a number of other ingredients in low mg numbers to round out the formula. The key to the formula is their Beta-sitosterol and hitting the 119 mg mark is solid. It can definitely help your prostate. Compare these sterols totals to what you see down at your local drug store with all the saw palmetto garbage and see how much better a value this product and other products filled with Beta-sitosterol. Rock solid.